Celebrating its 10th year, the Dorset Wildlife Trust’s Wildlife Friendly Garden Competition is now open for entry, with gardeners across the county invited to submit their wildlife havens big or small, to be judged over the summer. Categories include; Small, Medium, Large and Rented, as well as community spaces that are tended to by schools, businesses and groups, so everyone is welcome to enter regardless of their level of expertise or knowledge. 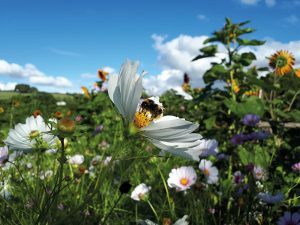 We’re hoping to reach out to more gardeners than ever before this year, as the competition links up with Dorset Wildlife Trust’s Get Dorset Buzzing campaign, a free initiative helping gardeners of all levels to encourage more wildlife into their gardens. Entry closes on Friday 31 May and an awards ceremony will be held at Castle Gardens on Thursday 25 July, featuring guest speaker and Dorset Wildlife Trust president, George McGavin.